This past week I had the honor of being invited down to Sandals Grande Riviera in Ocho Rios, Jamaica for the annual Sandals Travel Agent Recognition (STAR) Awards. Three years ago, in 2011, I was invited to my first ever STAR awards. It was a goal I had set for myself since I began selling Sandals in 2008. However, my grandfather fell ill and I knew I had to skip the ceremony and go back home to New Jersey to visit with him for one last holiday before he passed away. It was hard to give up my seat on that trip, but I was determined to be invited back again the next year. The following year, in 2012, I was invited back. I sat among the "stars" and watched as these agents accepted various awards. I felt inspired and told my local rep that the next year I would be up on that stage winning something. I was making it my number one goal. at the 2012 STAR Awards in the Bahamas. 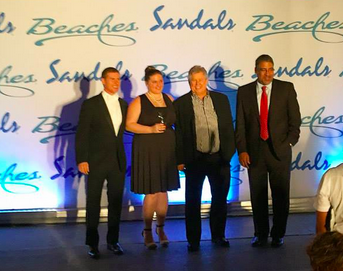 When the 2013 STAR awards at Beaches Turks & Caicos came around, I was thrilled to not only be invited back but to come home with three awards! The first was for Outstanding Sales Achievement, awarded to me in my name. The second was for the Best of the Best Agency in the Southeast Region of the US, awarded to my agency, My Paradise Planner. 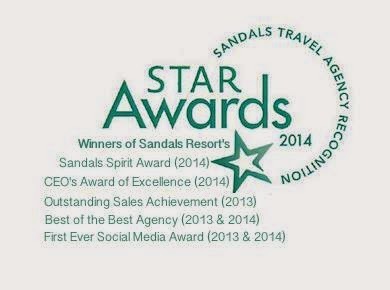 The third was Sandals' very first-ever Social Media Award, given to myself and two other agents who have used social media as a tool to grow their business while supporting and promoting the Sandals brand. I was thrill to accept all three awards both for myself and for the agency I had founded and grown into an agency of six agents strong at the time. 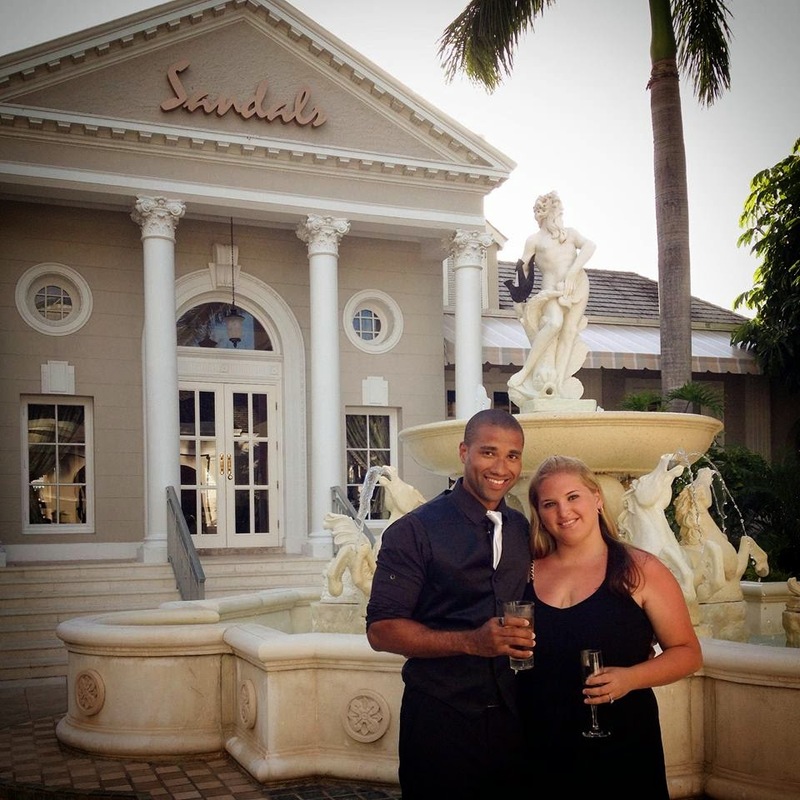 Sandals Social Media manager, Tiffany Mullins, and CEO, Adam Stewart. I returned home and was determined to work harder to make it back again, and even if I only took home one award, I'd have achieved my goal for the year. By the time the year passed and the date for STAR awards approached, our agency had experienced it's best year yet! My company grew by several more agents this year and with that growth came more amazing new clients to work with. I felt proud to have built an amazing team of "Paradise Planners"! So I hopped on a plane with my husband and business partner, Robert, and we made our way to Sandals Grande Riviera for STAR Awards 2014! 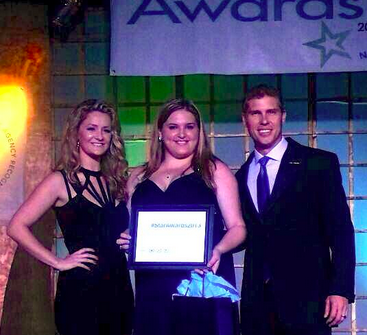 On the first night of awards, I sat among other agents from my Southeast region of the USA. I was thrilled to hear my name called for the "Sandals Spirit" award. For those of you that know me, my passion for travel started with my love of the Sandals brand. The first time I ever traveled outside of the US, I traveled to Sandals in Jamaica. I fell in love with the island and with the resort chain and it was my number one reason for deciding to change my life and make a living selling Sandals. Since then, I have built my company on the support of the Sandals brand and it's family, who now feel like an extension of my own family. So it was only fitting that for that award, I accepted it on the very island and at the resort chain I fell in love with all those years ago. I'm second on the right, with the white and black dress. On the second night, we attended the main award show. Being called up to accept the "Best of the Best" award for our agency made me feel even more proud than the year before when I accepted it. This year I was accepting it not only for me and my number of sales, but for my team of agents who have spent the last year working their tails off to sell the brand we all love to sell. It felt like more of an accomplishment to accept the award for us as a team than for me as an agent. all from different Southeast states in the USA. This year when they announced my name for the Social Media Award for the second year in a row, I was over the moon! Social media has been such an fundamental part of my business model so to be the only agent given this award for both years in a row meant so much to me. 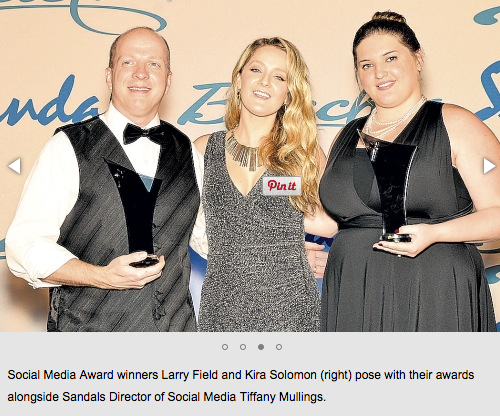 I was even more over the moon when later on I received word that the Jamaican Observer had posted an article and included the photo of me and the other award winner sharing the stage with Tiffany, the Sandals Social Media manager. Photo clipped from the Jamaican Observer news article. What I didn't expect that night was to take home any other awards. I had started my dessert, and was comfy in my seat. In fact, I had just finished taking a photo with the girls at our table when I heard my name called for the winner of the CEO’s Award of Excellence. I whipped my head around to see my name on the TV screen and before I knew it I was out of my seat and on my way back to the stage. 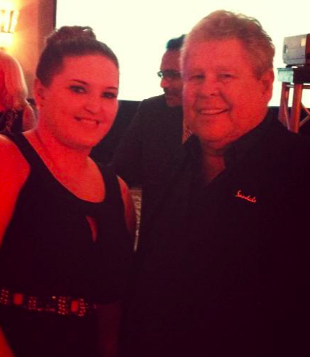 I shook with excitement as I stood up there sandwiched between the CEO, Adam Stewart and the Chairman, Butch Stewart. It wasn’t until after the photographs that I realized the Minister of Tourism for Jamaica was standing with us too! I was in complete shock and disbelief. Winning that award has to be one of my proudest moments with Sandals. It is the only award I’ve ever taken home that I solely won, without any other agents winning it too. And out of dozens of agents there that night, I couldn’t believe I was the one chosen. It’s a moment and an award I will always treasure. I can’t thank Adam and Butch enough for their support and recognition of me and my dedication to them. I told Adam later that “my cup runneth over”, and for sure, it truly did. Sandals Chairman and Founder, Butch Stewart, and Jamaican Minister of Tourism, Dr. Wykeham McNeill. But the night didn’t end there. 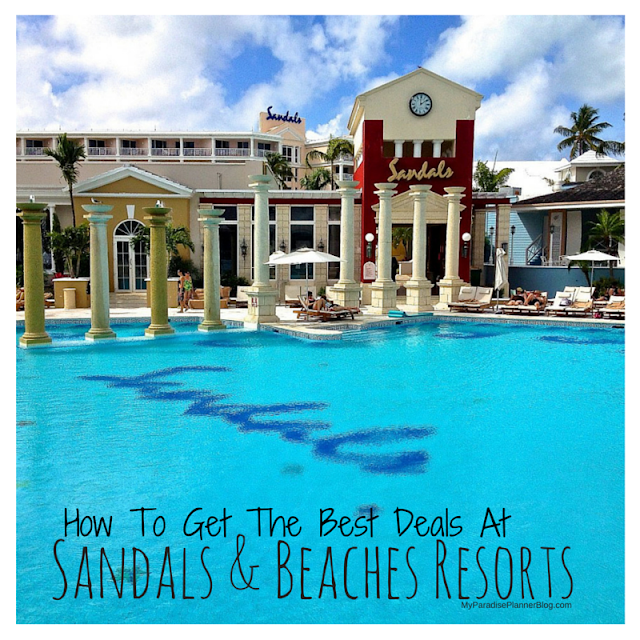 Sandals has a way of outdoing themselves time and time again for these events. So when the announcement was made to make our way outside to the stage for a special performance, we assumed they got a local band to keep the party going. What we didn’t expect was to be treated to a complimentary concert by the one and only Tessanne Chin! For those who don’t know, Tess used to preform at Sandals before she made it big as the winner of The Voice on NBC. She not only is a beautiful person inside and out, but she is an incredible performer and put on one hell of a show for us. She even gave me a high-five! Tessanne Chin preforming live from Sandals STAR Awards in 2014! In the end I took home four awards and was recognized for making the elite Chairman's Royal Club (top sales level for Sandals Resorts) again for a 4th year in a row. I feel blessed, honored, and am still sort of in disbelief. But that night, I fell asleep with a smile on my face, so big that I was afraid it may get stuck that way. So thank you guys again, SO much! For your support of me and my company, for referring your friends and family to me, and for choosing to book your Sandals and Beaches Resorts vacations with me time and time again. I love what I do and am thrilled to be able to be your preferred Sandals and Beaches Specialist! My husband and me at Sandals Royal Bahamian.